8.EE.3 - Writing in scientific notation - Use numbers expressed in the form of a single digit times an integer power of 10 to estimate very large or very small quantities, and to express how many times as much one is than the other. For example, estimate the population of the United States as 3 times 108 and the population of the world as 7 times 109, and determine that the world population is more than 20 times larger. Thanks to mathisfun.com, you can practice here to see converting scientific notation works. Scientific Notation is when you re-write a very large number of very small number using a base of ten with an exponent. This is so that you do not have to write so many zeros in the problem. Below are 4 excellent short videos showing us how to handle the first standard dealing with Scientific Notation. 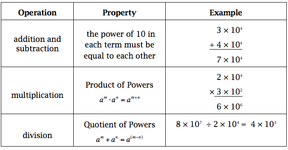 Here you can see how to write numbers in scientific notation and then how to compare them with each other. Tyler Dewitt shows us in these two videos how to perform addition, subtraction, multiplication and division of numbers in scientific notation. Worksheetworks.com has a very cool thing on its site that allows you to create problems on your own at a level that you want. Click on the image below to head there and practice some problems. They come complete with answers!